You’ve completed your training and you’ve made your first skydive. You’ve experienced the adrenaline, the excitement and the pure freedom that’s only felt when jumping from an airplane. It’s unlike anything you’ve ever done before! 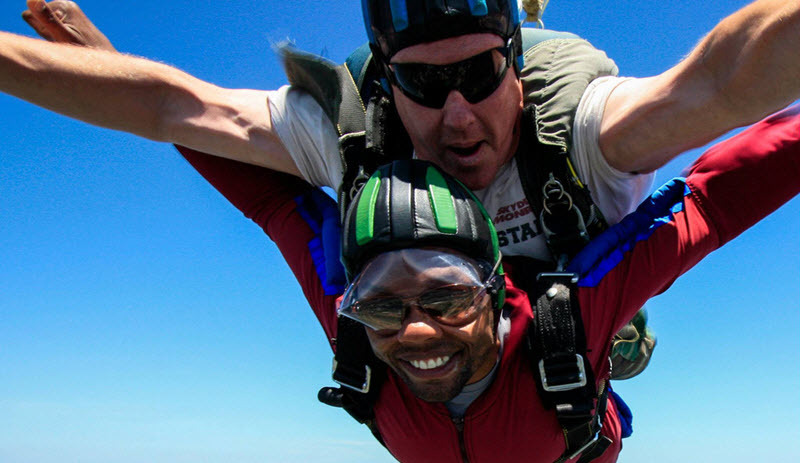 What could be better than the first time you jump out of an airplane? Every other time you jump out of an airplane! While your first jump is always going to be special to you, skydiving is a sport where progression and improvement is encouraged and supported. So with every jump, you’ll get better and better. The first step to that is to get your skydiving license. This is the license that says you’ve completed your training and proven your ability to skydive safely by yourself. If you earn your skydiving license with us here at Skydive Monroe, you’ll be able to use that license at any skydiving center in the US that’s also affiliated with the United States Parachute Association (USPA). Pretty exciting, huh? Your skydiving license is essentially your passport to skydiving as a hobby, and it opens up so many new opportunities to you. Find out about our skydiving courses here. Once you’ve got your skydiving license, the world of skydiving becomes your metaphorical oyster! With your license, you’re free to turn your attention to one of the many disciplines of skydiving. Most people start with formation skydiving (FS), which teaches you the skills you need to jump with your friends and to make shapes together in the sky. You’ll start out learning FS skills by doing some one-on-one coached jumps with one of our talented FS coaches. Through a number of levels, you’ll learn how to control your movements, including going up and down (fast and slow), turning and forwards and backwards. Ever wondered what Superman feels like when he’s flying through the sky? FS is your chance to find out! There are so many disciplines within skydiving. There’s pretty much something for everyone and as you grow as a skydiver, you’ll find the things you’re most passionate about and can focus on improving your skills there. As well as FS, there’s also FF, which stands for ‘freefly’. Freeflying is about flying your body on any axis, not just the belly to earth position we use for FS and you will have used during your tandem skydive (if you did one). You may have seen videos of people flying is a seated position or even upside down – that’s FF! Then there’s freestyle, which is growing massively in popularity at the moment. Freestyle is basically gymnastics in the sky, and it’s all about creating beautiful routines as you fly. There are lots of other disciplines, and variations within disciplines. You’ll never get bored in skydiving and there’s so much to learn. Like we said – the world is your oyster once you’ve made that first jump! One of the key parts of getting your skydiving license is to learn how to fly your parachute and use it to get you safely back down to earth. Parachute piloting is a really fun part of your skydiving progression after your first jump and, over time, you’ll progress to smaller, higher performance wings, too. Learning to fly your parachute will be covered in detail during your skydiving course, and you’ll learn what to do if anything should go wrong with your parachute, too. Every skydiver jumps with two parachutes, so we always have a reserve, just in case. Believe us; even if parachute piloting isn’t what attracted you to skydiving, that sense of total control and effortless flight that you get as you glide around the skies will become one of your favorite parts of your new hobby! So what do you say? Are you ready to make skydiving part of your life? Book your skydive today!